The arrival of the rain over the last week or so seems to have kept us off the allotment for a while, we've been so used to lovely dry weather it's been hard to fancy a trip up there under dark clouds and the prospect of imminent drizzle. However, last night was sunny so we got our backsides in gear and popped up for an hour or so after work slightly worried about what we'd find. Thankfully while the weed perfect weather had caused quite a few to raise their heads it wasn't too bad and will only take half an hour with a hoe to return it to some sense of order. 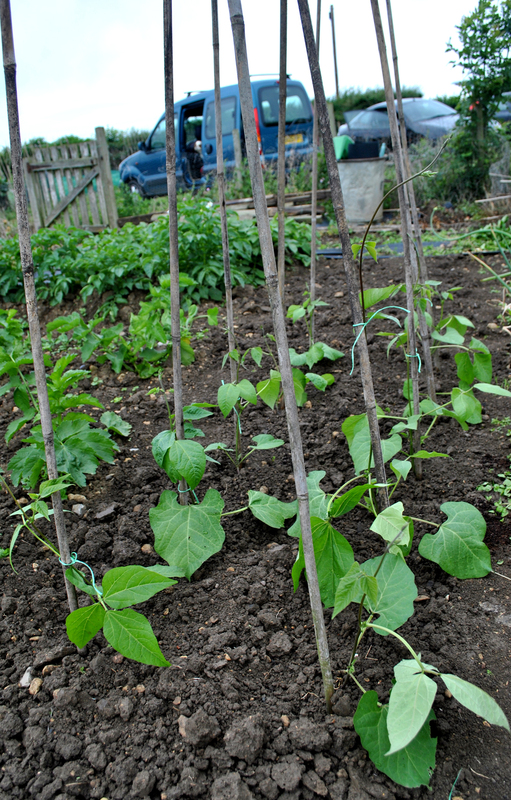 That wasn't the task of the evening though, we were there to harvest the garlic and plant some runner beans. This was our first proper attempt at over wintered garlic and I have to say I've been quite impressed with it. Every plant survived the snow and while a few of the bulbs were a little on the small side most had swelled up beautifully. 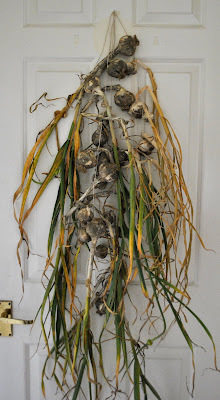 In the end we harvested about thirty bulbs most of which then got strung up in the spare room to dry when we got home. We also finally got some runner beans in the ground. We'd kind of given up on growing any this year as we simply never planted any, however, when a kind soul at work had a few plants spare I jumped at the chance of giving them a home. Even then they'd been sat in the greenhouse for a week patiently waiting to be planted out so it was great to finally get them off my conscience and into the allotment. A couple had got quite tall so I've tied them to their canes in the hope they'll work out what to do once they realise they've now got something to grow against. The beans will work out what they want to do which isn't necessarily what you want. We have our last lot to plant out each one set by it's own cane but like small children given half the chance they will prefer to hop into someone else's bed or climb up a neighbouring cane. It looks like your garlic's done very well. I don't grow it myself as we don't tend to use much in cooking. My beans are still waiting to be planted out. I'm hoping to get them in the ground this weekend but the weather forcast doesn't look too good. We didn't bother this year as we started too late. Will consider it this year! 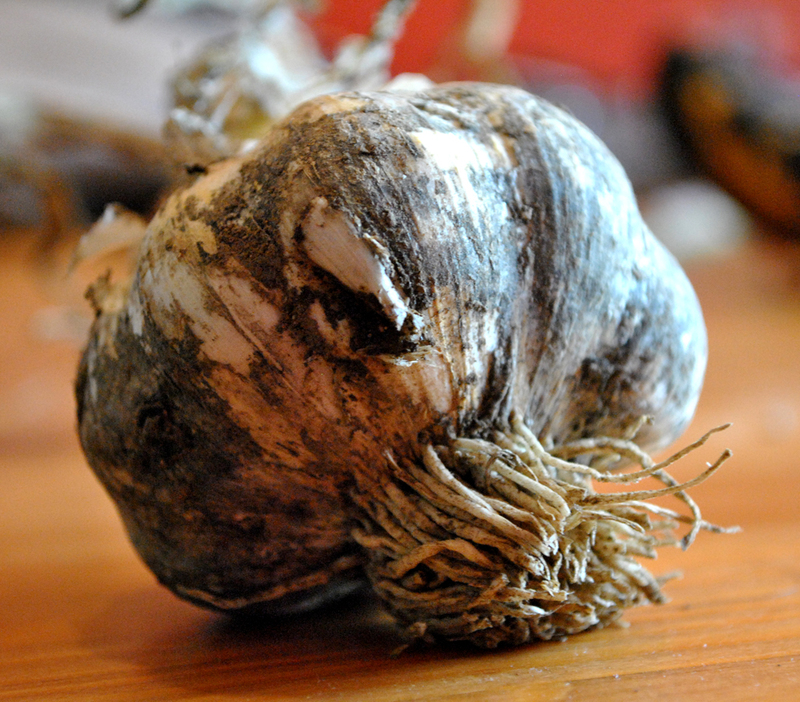 Your garlic looks great! I'm trying my first plants this year and hope they turn out well.